LOVE NEVER DIES... Sometimes it kills! One could say that we make films because we are so haunted by the movies we saw in our past that we feel compelled to create new ones. That might explain why director/producer Peter Szabo has been wanting to make films ever since Jaws scared the wits out of him as a little boy. 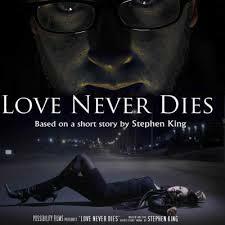 It also hints at the haunted protagonist at the heart of Peter's latest short, Love Never Dies. Thematically, Peter is attracted to dark and tragic tales so it's no surprise that he adapted "Nona" by Stephen King for Love Never Dies after acquiring the non-commercial adaptation rights through the Dollar Baby Scheme. SYNOPSIS: Based on the short story, NONA, by acclaimed Master of Horror fiction, Stephen King, LOVE NEVER DIES follows a drifter who wanders the night, seeking to escape his tormented past. One night, he meets the mysterious and seductive Nona, a woman cast from his darkest fantasies, who lures him on a deadly chase to uncover the horrifying truth he so desperately wants to avoid. Inspired by the creepy corners of King’s imagination, LOVE NEVER DIES explores the razor-thin line that separates the allure of love from the romance of murder. 1. ACQUIRE INTELLECTUAL PROPERTY THAT IS A WELL-KNOWN COMMODITY OR PARTNER WITH A FAMOUS PERSON TO GET AUDIENCES INTERESTED. On April 2010, Peter obtained permission from Stephen King to adapt one of the available shorts through the Dollar Baby Scheme King has set up. From May through November 2010, Peter wrote and revised and rewrote the script adaptation. Aside from enjoying the short story, Peter reasoned that adapting a Stephen King story would attract attention from within and without the horror genre and further his career as a filmmaker. 2. IT'S OK TO MAKE CHANGES TO THE ORIGINAL SOURCE AND SACRIFICE SPECIAL EFFECTS IF IT SERVES THE NEEDS OF THE STORY. Part of what led Peter to revise the script numerous times is that he was aware of his budget and he wanted to ensure he would not be like the typical filmmaker unable to complete the project. Therefore, he decided to eliminate or reduce some special effects that would be needed to transform the original story directly to screen. Thinking low budget was actually helpful too since it allowed him to rethink scenes, as he states, "I was unsatisfied with the logistical need for the biggest effects sequences and was happy to rethink the scenes for more practical story and production purposes." Peter then financed the short with his own funds and paid the cast and crew with discounted fees, credits and viable experiences in a film with potential. Flexibility was key in having a short story meant to be read be appealing in a medium meant to be watched and heard. In adapting the story, Peter clarified with Stephen King’s office his need to take liberties with certain story elements and even the title, to focus more on the psychological aspects of the horror rather than the supernatural horror elements in the story. For example, he thought the original story title, Nona, didn’t give any sense of what the genre of the film might be and could be confused with an aunt or grandmother, to whom the term Nona is applied in other languages. Hence, NONA became LOVE NEVER DIES. 3. ALWAYS HAVE A BACKUP LOCATION. Locations are crucial to every film production and filmmakers go through extraordinary lengths to acquire rights to use them (or even 'steal' them). But hard-fought locations can disappear at a moment's notice that's why it pays to have an alternate location. As Peter recalls, "I had been told that a critical location (the cemetery) would be donated by the city, but when it came time to sign agreements, a higher management staff member demanded thousands of dollars for the location expense. I declined the demand for a location fee and quickly found an alternate cemetery that was donated to the production at no cost." Although the first cemetery was ideal with a chapel-mausoleum suitable for exteriors and interiors, Peter had to be creative with his options once he lost it. "When I was unable to acquire an ideal location with access to the interior of a chapel or mausoleum, I ended up using a cemetery and chapel only for the exteriors, and then had to change the script to have the characters enter the basement of the chapel, so that I used the basement of an old home for the interior." 4. DON'T RUSH GATHERING YOUR CAST AND CREW, THE EXHAUSTIVE SEARCH IS WORTH IT EVEN IF YOU FIND WHAT YOU NEED CLOSE TO HOME. With the help of Reese Eveneshen, Peter was in preproduction from December 2010 to March 2011, arranging for a cast, crew, locations, props and other items required during this phase. He rented a Canon 7D camera, 3 "redhead" 1000K lights with stands, plus some light panels and a Lowel Pro light kit. For audio, he rented a Sennheiser Shotgun mic and Sennheiser Wireless Lapel Mic kit of 4 mics. All on-set audio was recorded with a Edirol R-44 digital recorder. He also secured a 2nd 7D as an in-kind donation from a camera assistant who brought his own camera and donated it and his talents for 2nd camera setups on some shots. Using DSLR cameras simplified production in terms of not needing to load tape or film, and being able to shoot up to 45 minutes of footage on one SD card. Fortunately, all locations were in-kind donations and even city permits were free. Key crew members were carefully selected and paid discounted fees by Peter. Via word-of-mouth, Peter found volunteers who could work as production assistant. Peter conducted open casting auditions in Toronto and Guelph, Ontario to find the main roles and ended casting close to home; Erin Stuart, the woman handling wardrobe and makeup--knocked it out of the park and was exactly what he was looking for in the lead female, Nona.Then on top of that, Erin did her audition with her boyfriend and one of the film’s producer, Reese Eveneshen, who did such an amazing job in the lead role of Steve that he ended up being casted, as well. Without a wide net casted over many potential actors, Peter could not have determined that the principal roles should be played by people close to the production. Key crew members like the DP, AC,1st and 2nd ADs were paid discounted fees. Principal roles were paid $50 per day. All minor cast and crew members were volunteers. 5. GO SLOW TO GIVE YOU TIME AND MONEY TO COMPLETE THE SHOOT. "Spacing out the shoot days was actually a boon. Although we spread out the 11 shooting days over 5 weeks because we had to work days jobs, it did offer us the advantage to meet between shoot days and improve our planning and on-set production efforts." Shooting was slated for weekends during the period of March 13 through April 3. Aside from discussing the script and rehearsing, he prepared the 2 leads by taking them on a tour of all the locations in the same sequence they would appear in the finished film, so that they could experience the journey of their characters. Then during the shoot he would have brief discussions, one-on-one, on set before and between set-ups. Like a consummate professional, Peter conducted several face-to-face preproduction meetings with the crew. He continued having follow-up meeting through the weeks of shooting with weekly face-to-face production meetings between the shoot dates. He was organized and kept cast and crew up-to-date with an email exchange for call sheets and important details. 6. YOU NEED AN A.D. AND/OR PRODUCTION MANAGER YOU CAN DEPEND ON. "A good 1st AD or Production Manager to lead the crew in arranging all aspects of equipment and set up is a MUST. You need to have regular meetings with them between shooting days to discuss what worked and what needs improvement. It's very important that I as director and producer can delegate the coordination of the crew and equipment to the 1st AD and Production Manager, so that I can show up on set and everything’s ready for me to start preparing shots." With the help of the AD and the Production Manager, he stored schedules, release forms, production plans, scripts, and any other production documents in a shared Google Drive folder, for all to access. Gas, supplies, and transportation expenses were reimbursed. When weather conditions forced them to postpone the shoot 3 times, Peter was able to rely on his AD and Production Manager to figure out better weather days, rearrange logistics and reschedule the entire cast and crew for an alternate shoot. 7. ASSUME PROBLEMS WILL ARISE BECAUSE THEY WILL BUT AT LEAST ANTICIPATION WILL PREPARE YOU TO DEAL WITH THEM. Despite the diligent preparation, "Murphy's law" couldn't be denied and the shoot faced a couple of on-set challenges. The first one occurred when a lighting rig blew over in the wind on an exterior set, causing an hour delay. The crew jumped into action replacing the broken light bulb. Then the 2nd AD stood and braced the lighting rig with his body during the rest of the shooting time which was about 2 hours. The second caught the filmmakers by surprise when one street location which seemed remote and quiet at night during their location scouting turned out to get busy during certain intervals. This was due to a local factory with multiple shift workers letting their people out during times that coincided exactly with the shoot. This caused repeated delays due to traffic control issues. To resolve the traffic issue, the filmmakers were forced to grab short shots between the waves of passing cars. The third challenge occurred when the fog machine effects technician jumped into a ditch to avoid being in a shot; he twisted his knee and tore his ACL. Fortunately, there was a nurse watching the film shoot from the sidelines, who examined and diagnosed the injury as non-critical. A P.A. drove the technician home and shooting resumed. As a result, Peter realized the importance of having someone with first-aid training around. (I recommend at least having a first aid book and kit handy on the set. ~~ danny indio) "Overall," says Peter, "Everyone worked incredibly well together and there were no complaints--only smiles and appreciation for the opportunity to contribute." 8. THE BEST SPECIAL FX ARE NOT ALWAYS THE MOST EXPENSIVE ONES BUT THE ONES THAT ADD TO THE MOOD AND ATMOSPHERE AND SHOCK THE AUDIENCE WITHOUT TAKING THEM OUT OF THE STORY. Soon after shooting ended, Peter jumped into action. He already knew what he wanted for visual FX and the score since it was planned in advance. But the rough cut had to to come first. "I did the first rough edit. Then I passed the first edit to producer and lead actor, Reese Eveneshen, for an editing polish. He sent me newly edited complete versions of film... I made notes, we met and discussed changes, and they were implemented." From the get-go with the script, Peter had dramatically reduced the number of special effects from the original story to use the most effective ones that could be transmitted effectively with his budget. During his edits, Peter experimented with video filters in Final Cut Pro which he used to add distinct effects to the internal, fantasy sequences that marked them as mental visions and not actual events. After visual effects were complete and inserted, a colorist corrected the entire film. 9. SKIMP ON GETTING GOOD SOUND ON THE SET AND YOU WILL PAY A STEEP PRICE IN POST. The one thing that Peter overlooked was getting a topnotch soundman; this is a typical problem for filmmakers more concerned with the look or the acting than the sound. Unfortunately for Peter, much of the on-set audio was unusable due to generator noise, restaurant fans, and other weather elements but the sound recordist was determined to correct the problems. He committed to doing post-production work such as audio fx, Foley, and sound mix to correct the bad audio. During the shoot, Peter had foreseen the possibility of some audio problems and informed the sound recordist to tell him of any problems while recording on the set. The sound recordist was upfront and let Peter know about the problems so that he could fix it in post. "We had to do ADR for about half of the dialog." He also paid two writers for the score and one song according to his original plans. He considered paying for sync and master rights to one background song but, after many emails and phone calls, he learned that "just the sync rights for a song I wanted in the background of a bar scene, would be $500. I would then have to pay another few hundred for the master recording license." That went beyond his budget. Instead, Peter hired a songwriter to write an song with a similar mood and rhythm for the background song. 10. DO A TEST SCREENING BEFORE SENDING TO FILM FESTIVALS. After a final audio mix was delivered, Peter screened the film in a theater and discovered many issues where dialog wasn’t in sync with lips, audio levels were too high or low, etc. The audio engineer completed another mix, using the notes we compiled from the theater screening, and the next audio mix was excellent. After getting audience feedback and ensuring any sound quality issues were taken care of, Peter locked picture and was ready for festivals and distribution. WORLD PREMIERE: Short Chills and Thrills Film Festival, Guelph, Ontario, Canada - Oct. 28, 2012. Since the film was shot in full HD (1920 x 1080) and he wanted it to play well on a cinema screen, Peter had to export the file and burn Blu-ray copies. "Unfortunately, no one that I knew in Guelph had a Blu-ray burner, so I had to ship a hard drive to Toronto and pay for Blu-ray authoring and burning. By the time of our second festival screening, we had re-mixed the audio and I couldn’t afford the time or money to have it authored in Toronto. Fortunately, I discovered that a filmmaking colleague had a Blu-ray burner so I was able to burn new copies for free." 11. MAKE AN EVENT OUT OF YOUR TEST SCREENINGS TO BUILD BUZZ AND RAISE FUNDS FOR YOUR PRODUCTION OR A CAUSE. Peter had his press releases printed in local papers. He then arranged a screening at the repertory theater using Facebook and direct invitations to friends, family, cast, and crew. The gala screening event was sold out to 130 people and also served as a fundraiser for a local media arts organization. Overall, his initial strategy to reach local audiences was effective. 12. DON'T BE DISHEARTENED WHEN THINGS DON'T PAN OUT EXACTLY AS YOU PLANNED, YOUR FILM WILL STILL FIND SUCCESS IN UNEXPECTED WAYS ONCE YOU PUT IT IN THE FILM FESTIVAL PIPELINE. The next phase of his plan involved selecting 10-12 2nd and 3rd tier festivals with mainly genre focuses on horror, supernatural, thriller. This phase of the plan has not been completely successful so far since the film has been rejected from about 5 festivals. However he is still waiting to hear from 5 more regarding acceptance. "Part of my calculation was that I thought the Stephen King name would attract attention and improve my odds of acceptance at festivals. It's still too early to know for sure how much his name has improved my odds. This strategy has worked at festivals that screen King Dollar Babies exclusively. As a result, Love Never Dies was invited to screen in The Netherlands and Argentina at King Festivals this Fall 2013. I also sent a Blu-ray copy to Stephen King but I’ve not yet heard from him on whether he watched it and if so, what he thought of it." After the premiere in Guelph, a Toronto horror film festival organizer contacted me and asked to screen Love Never DIes as an official selection at the Blood in the Snow Canadian Independent Horror Film Festival, Dec. 2, 2012. Press and social media helped successfully spread the word about the film for a well-received screening in Toronto, Canada. As of July 24, 2013, Love Never Dies is an official selection in the Macabre Faire Film Festival in Pennsylvania, scheduled for Sept. 6-8. 2013. The film is still pending notice of acceptance in about 5 other film festivals. Peter will also be applying to more festivals over the next 6 - 12 months, as notices of acceptance come in and based on a limited festival submission budget. "It bears repeating here (and elsewhere): Ensure you have a qualified sound recordist for all production shoots, even if you have to pay a little extra. You will likely need to pay even more in post-production for flawed audio. So make damn sure audio is recorded well. Listen to playback of audio recordings either on set or after the shoot and before the next shoot day, so that corrections can be made for subsequent on-set shoots." "When shooting exteriors, know the weather conditions down to the hour. And because the weather is finicky, be prepared for rain, cold, and even snow when you least expect it by having the proper gear to deal with it or an alternate schedule." "For your key cast and crew, make sure everyone is committed to doing their best, is enthusiastic about filmmaking in all aspects, has no ego invested in shining brighter than other players, and is committed to all production days in advance. In no- to low-budget filmmaking, integrity, accountability, creativity, and passion are the keys to a successful project."